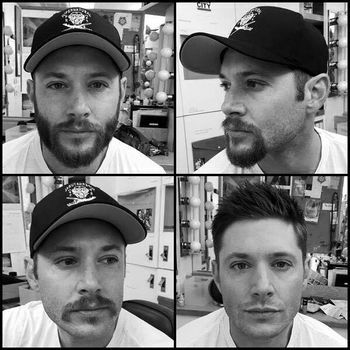 Both Jensen and Jared have made a habit of eschewing the razor in the three month break between the filming of seasons each year. The beards are generally referred to by fans as "hiatus scruff" although both have been known to sport full mountain men growths. Also termed by some (Australians) as the ranga beard. 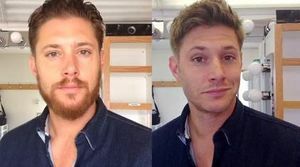 When filming for season nine commenced on July 11th, 2013; director Guy Bee posted a video of Jensen's transformation from his usual hiatus-grown beard to Dean. In season nine, Dean's estrangement from Sam in the middle of the season led to Dean's five o'çlock shadow growing longer into what fans budded the "Break-up Scruff" and the "Beard of Feels." 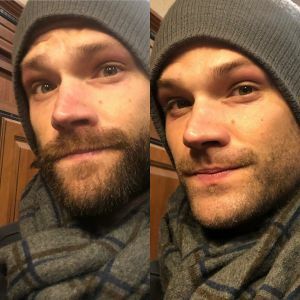 Season 14, which commences three weeks after Michael has taken over Dean's body and disappeared, sees Sam sporting a beard, soon dubbed his "grief beard" based on the premise that due to his desperation to find his brother, Sam has not had time to shave. Jared and Jensen talk about the origins of the grief beard with Sam Highfill at the Season 14 advance premiere screening on 1st October 2018. 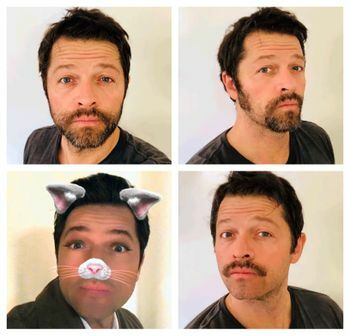 Jensen posted a series of photos, taken by Misha, mapping his transformation from Hellatus Jensen to Dean in Season 12. 1.1 8.02 What's Up, Tiger Mommy? When Dean reunites with Castiel in Purgatory, Dean comments on his "peach fuzz." Dean: Damn! It's good to see you! Nice peach fuzz. In the Bunker, Dean comments on how Sam's beard disturbs him, but Sam thinks he looks good. Later, Sam's beard is given a compliment by Jody, much to Dean's dismay. Dean: It's just every time I think about it, you know, it's like a -- it's like a nightmare. I mean, I can't eat. I can't sleep. It's always just there watching. 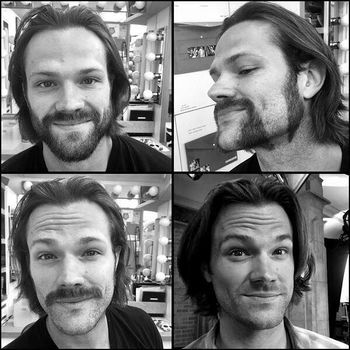 Sam: Dean, it's just a beard. I've been a little busy lately. Dean: Yeah, well, that's not an excuse. You know, 'cause, uh, "Duck Dynasty" called, and they just -- they want it all back. Sam: Some people say I look good. Dean: No. No, Sam. No people say that. Jody: Hey! I like it! Sam: What? Oh. Yes, I shaved. Dean: I mean, it's so smooth. It's like a... dolphin's belly. Sam's "grief beard" makes a reappearance in a flashback to the time when Dean was possessed by Michael. This page was last edited on 12 April 2019, at 07:08.